Limited Time Offer, Quanities Are Limited to Available Inventory. Pricing Includes Pins, Clips and Rail Supports (when required) Rings are sold separate unless otherwise noted. 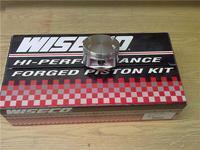 Wiseco Cadillac Northstar 4.6L V8 Pistons. Flat Top with 4 valve reliefs. +.020" Oversize. *Pistons require stock style rings. Part # EXP6885 - 3.681" Bore, 1.265" Compression Height. 21mm Pin (Fits 2000-03 engines) $395.00 CAD per set of 8. 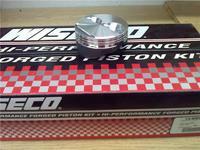 Wiseco Chevrolet 4.3L Stroker V6. 1 Set of 6. 0cc Dome 4.040" Bore, 1.000" Compression Height (3.500" Stroke w/ 6.250" Rod Length) .927" Pin. Fits Stock 22 Degree Cylinder Heads. Includes lateral gas ports & skirt coating. Pistons require 1/16 x 1/16 x 3/16 rings. Wiseco Ferrari 330 GTC, GTS, GT V-12 Pistons. 1 set of 12. +21cc Dome. 3.051" Bore, 1.203" C/H, 18.50mm Pin. $795.00 CAD *Price Includes Piston Rings. $595.00 CAD *Price Includes Piston Rings. Optional K1 H-Beam Connecting Rods - In Stock!